The Hudson Hospital expansion project called for new administration and clinical wing construction, including hallways, lobby, waiting room, and stairs. McGough Construction was the general contractor on the job. Concrete Arts, a decorative and polished concrete firm local to the Hudson, Wisconsin area, has had an existing relationship with McGough for years, and they hired on Tom Graf and his crew, owner of Concrete Arts for their expertise in polished concrete craftsmanship and concrete design. The project scope included dyeing and polishing both new and existing concrete floors in the lobby, hallways and waiting areas, as well as creating and polishing structural stairs. There was just one problem: the link between the old and the new concrete needed new mechanical trenches dug through the concrete. These trenches were needed to accommodate new electrical and plumbing runs. Based on that, Graf decided the floor was not a good candidate to polish. Additionally, the project schedule was tight, and the owners were looking to occupy the new spaces by mid-fall. Graf analyzed the job and recommended Durafloor TGA, a decorative, polishable overlay wear topping designed specifically for such situations. This versatile product could be placed in both new and damaged spaces in the lobby and the hallways—all high foot traffic areas—with fast turnaround time. Concrete Arts’ crew had to mill down the concrete surface 3/8 in. in order for the substrate to accept the TGA overlay, which was very time consuming. They then filled and repaired all cracks with L&M RESTORE. Next, the team re-saw cut and honored all existing joints and filled them with L&M JOINT TITE 750. From there, they applied L&M EPOPRIME epoxy primer onto the properly prepared surface and seeded it with silica sand to rejection. After allowing the sanded epoxy to dry, the excess aggregate was vacuumed and broomed from the surface. After surface prep was complete and the sanded epoxy cured, Concrete Arts’ crew then mixed and placed the Durafloor TGA polishable overlay. After allowing the freshly placed topping to cure for about 16 hours, the surface was ground through the diamond chain to a 1,500 grit full polish, with two coats of L&M VIVID DYE applied to match the existing concrete’s color. The crew locked-in the dye and densified the overlay with L&M LiON Hard hardener densifier. Finally, the crew applied L&M PERMAGUARD as a stain protector for the newly polished surface. Since the stair treads offered by competitors did not match up with the newly polished floor, Durafloor TGA’s versatility enabled the Concrete Arts’ crew to pre-fabricate the stairs to an exact match of the polished concrete floor. Cranberry glass aggregate seeded into the wear topping created the stair treads. The structural stairs were polished on three sides spanning 6.5 ft. each. The front portion of the stair treads were sandblasted for slip resistance. The solution provided the hospital owners with a near-perfect link between the existing concrete floors and the new Durafloor TGA floors. It exhibited a homogenous look and feel of approximately 3,500 sq. ft. of flooring space. Hudson Hospital administration and the McGough project managers were very happy with Concrete Arts’ work. Their double shifts paid off by showing the results of a beautiful, durable, near-match of the existing decorative concrete. By recommending, placing and polishing the decorative Durafloor TGA overlay wear topping, Concrete Arts’ crew turned-over the Hudson Hospital project on time. 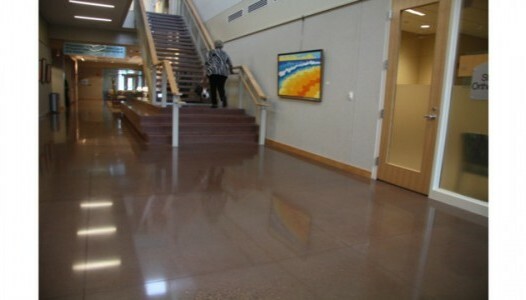 Speaking to the distinctiveness of the polishable wear topping, Graf states that there is no other cementitious flooring product on the market that resembles such unique, durable, decorative concrete. Hudson Hospital’s new addition opened in October 2014.